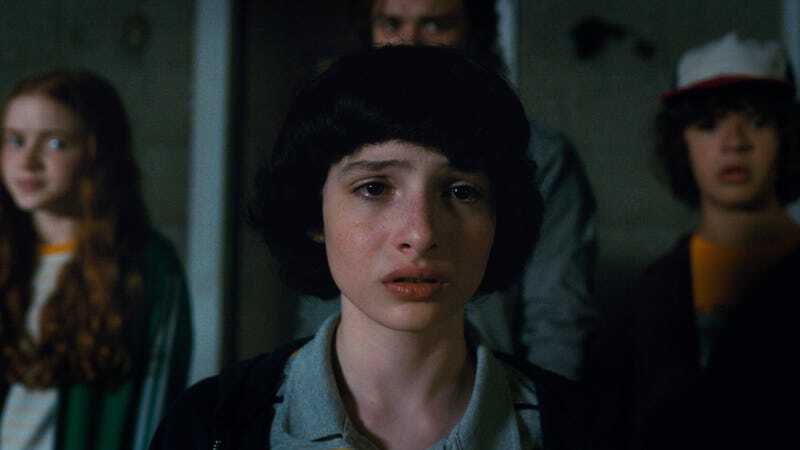 The characters in Stranger Things have always lived on the unstable junction between one dimension and another, a breach in space that allows passage from our world to a much bleaker and more sinister one. And now, that monster-filled universe is transitioning into the most nefarious world of all: Mass-market print publishing. Deadline reports Penguin Random House is pairing up with Netflix to produce a series of books based on the supernatural series. The first two installments, however, won’t be fiction: Coming out this fall will be Stranger Things: World Turned Upside Down: The Official Behind-The-Scenes Companion, which is definitely the right amount of colons for a book title. The second one doesn’t have a title yet, but is set to be a hardcover gift book for younger readers, containing—in the words of the publisher—“advice, wisdom, and warnings from the Stranger Things world.” So, helpful life hacks like, “Seek help if you start coughing up black goo” and “Don’t be named ‘Barb,’” we’re guessing. Following that in spring of 2019 will be a prequel novel, written by Gwenda Bond, that delves into Eleven’s mother and the MKUltra program we learned more about in season two. Subsequent titles will follow, though there are no details as of yet. Let’s hope none of them involve abandoning everything interesting to go hang out with a fellow super-powered youth and her irritating gang.